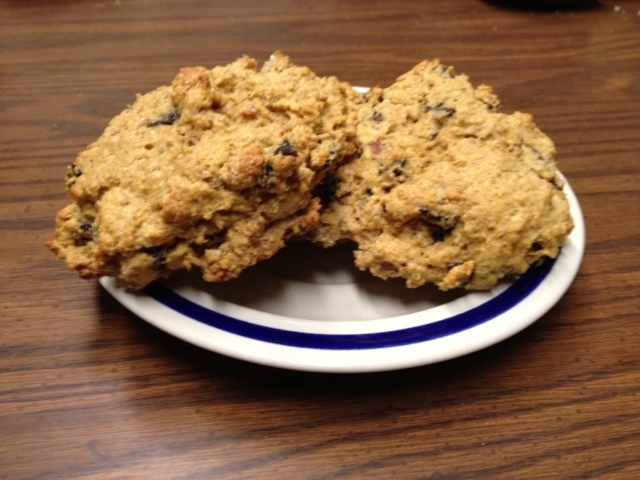 Scones are fun to make and can be relatively healthy. Here’s one I put together with ingredients on hand. I only have a few left after an hour, so it must be a keeper. Mix flour, sugar, salt, baking powder, cinnamon, and lemon zest together in a large bowl. Pour into large bowl of flour mixture and combine until dough just sticks together. Do not over mix. Generously spray 2 double lined cookie sheets with SPAM or other vegetable oil. Using 1/4 cup, drop dough on sheets approximately 2 inches apart. Brush dough with additional milk and sprinkle with sugar. Put cookie sheets in freezer for 20-30 minutes. Preheat oven to 425 degrees F.
Bake approximately 15-20 minutes. Serve with butter or jelly/jam. NOTE: If you do not have double-lined cookie sheets, put parchment paper on the cookie sheet – the scones will burn easily if precautions not taken.